For my first conversion of Skylla I wanted to start as far back as I could while still using a proper "Witch" class. Plus I want to do something that is more similar to a "wizard" class. For those reasons I am choosing to use Spellcraft & Swordplay (since it is very much like OD&D) and the warlock class from Eldritch Witchery. - While the original Skylla was 6th level, I am going to stat all my versions as 7th level. The reasoning is that a lot of my witch classes gain a power at 7th level and many others have at lease one power by that point. 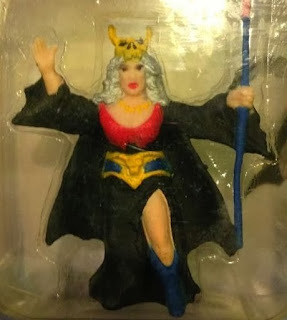 - I am also working under the assumption that Skylla began as a good character, either as a good witch or a good magic-user/wizard and then soon became evil. By 6th level she is unrepentant chaotic evil. So her initial options as a character would be the ones a good character might choose. - I am keeping her same stats, but I am going to rearrange them so her Prime Attribute always has the highest value (in this case 15). - I am going to try to give her the same or similar spells from her original stats. I choose the Warlock class since it seems to fit my narrative of her. Warlocks are "betrayers" and evil typically, but they don't have to be. You can use Eldritch Witchery to make a good Warlock. Evil just happens to be easier. Also Warlocks are an advanced class of Wizards (Magic-Users) so it fits. She belongs to the Goetic Lodge. Figured that it was the best choice to fit a character that wanted to seek out more magic. Some rearrangement of spells but still comes close. There is no Staff of Commanding in S&S, but there is the Staff of Enchantment which fills the same niche.